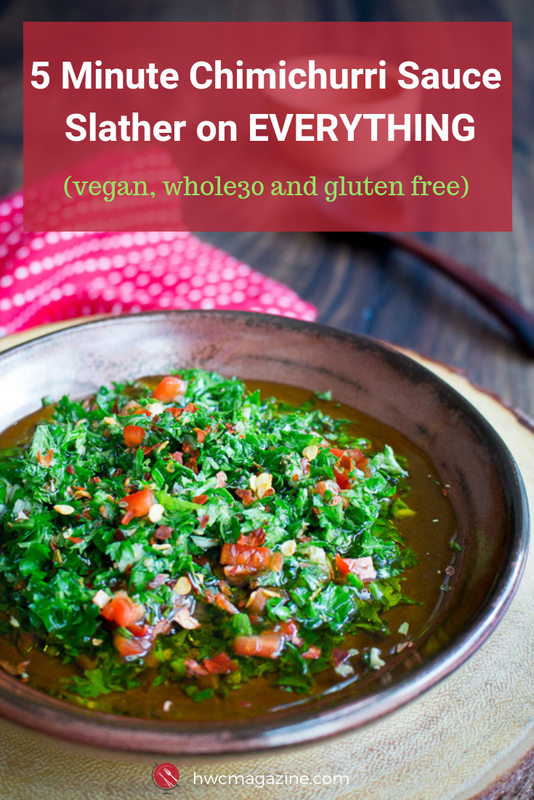 Spicy 5 Minute Chimichurri Sauce is your new go to gluten-free and vegan GREEN SAUCE. You are going to want to slather on everything from steaks, empanadas to eggs. Spicy, zesty, fresh and garlicky. Really anything that has the description of garlicky, we are in! How about you? In addition, this sauce is low carb so we have been slathering it on everything. This is going to be a quick, down and dirty post as this sauce takes only 5 minutes to prepare so all you need to do is to scroll down to check out the ingredient list and you are good to go. 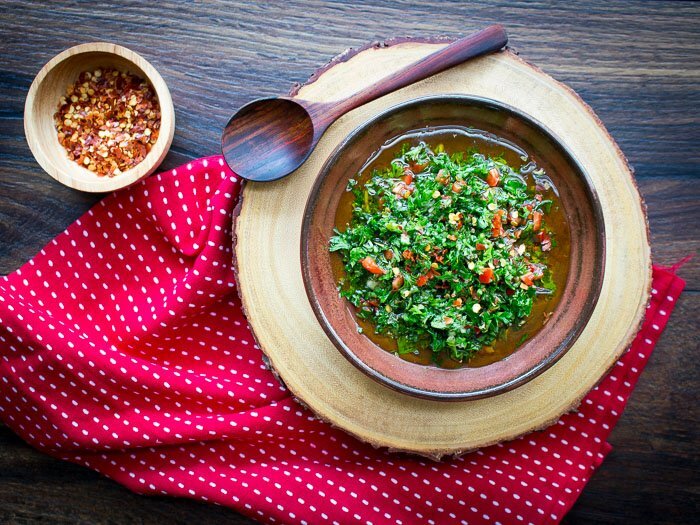 Chimichurri sauce is a fresh sauce made primarily from parsley, garlic, red wine vinegar and extra virgin olive oil. We added in a little fresh red chili along with dried red pepper flakes to give it an extra kick. This week we are celebrating a Spanish Tapas party and you are invited. Have you had a chance to check out our Beef Empanadas recipe? 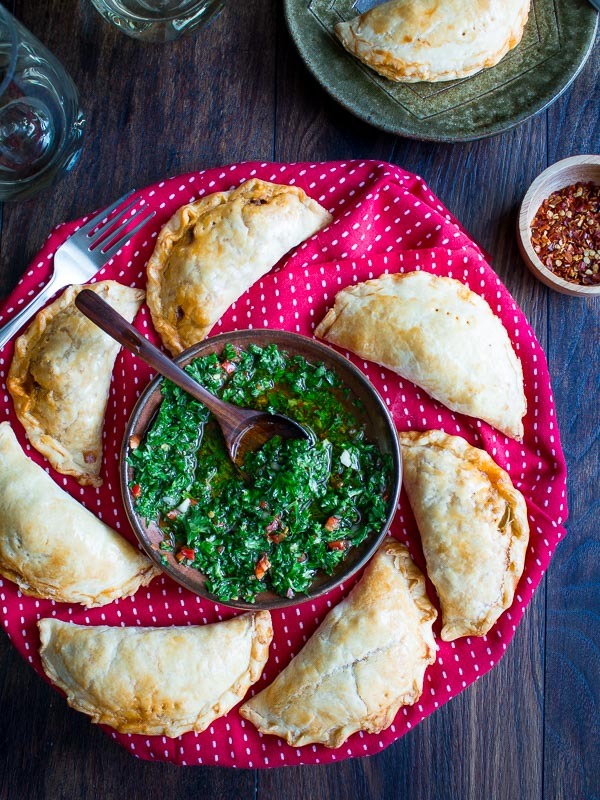 Spicy 5 Minute Chimichurri Sauce is the perfect fresh topping for these flaky crusted spicy beef empanadas. With the holidays around the corner, a Spanish Tapas party is always a good idea. Delicious little treats like our Spanish meatballs, a tray of Spanish meats, cheeses and olives, beef empanadas and sangrias make for an easy and fun gathering theme. Don’t forget dessert! Our Best Orange Almond Flourless Cake is the perfect sweet ending to a fun evening. The best part about making your own Spicy 5 Minute Chimichurri Sauce is you can make it as spicy or mild as you like it. We have had chimichurri sauce literally all over the world but hands down the spiciest version was in Bangkok, Thailand at the El Gaucho steakhouse. Yep, you guessed it. They used those little but mighty bird chilies in the mix. Felt like a fire breathing dragon after our first bite, but so tasty. 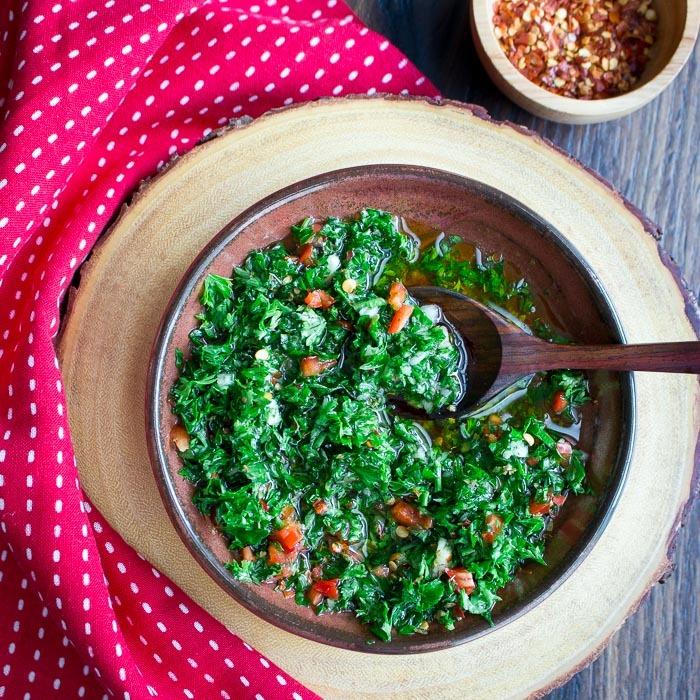 The best way to make chimichurri sauce is to chop your ingredients by hand. You can, if you wish, throw the fresh vegetable ingredients to be chopped in a food processor but do not add the oil and vinegar to the mix this should always be added separately as it changes the appearance of the sauce. We would much rather quickly clean a cutting board and knife then to have to hand wash a food processor, knife and a cutting board. That is just how we roll. 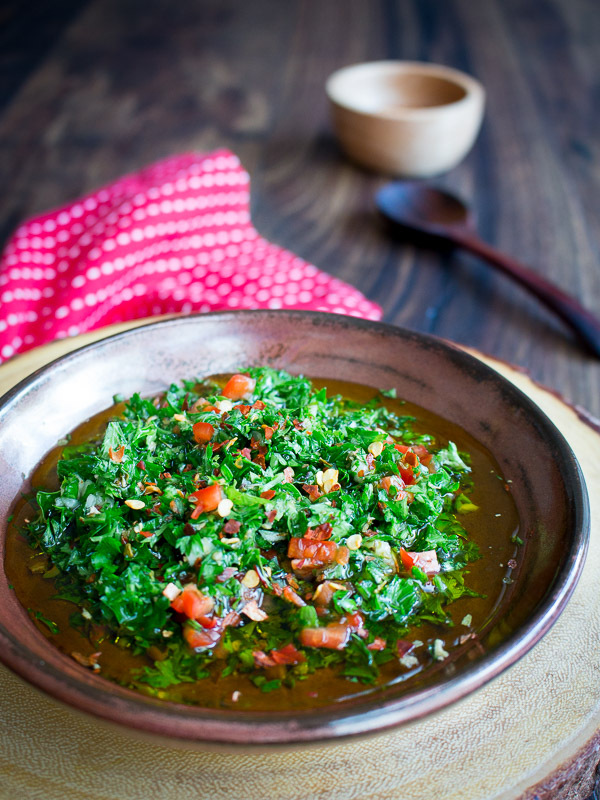 What is your favorite way to eat chimichurri sauce? 1Add finely chopped parsley, garlic, dried oregano, red chili pepper, red pepper flakes, red wine vinegar, olive oil and salt and pepper to taste. 2Let the flavors mingle for 30 minutes before serving. Enjoy! 3Best if used within 24 hours but can store in the refrigerator up to 36 hours and then you should dispose. Fresh chopped garlic does not keep long if not completely submerged in vinegar. Both flat leaf parsley and curly parsley are okay. Flat leaf is more traditional but use what you have on hand. Adjust the fresh red chili and dried red chili flakes to your desired heat level. Both are optional.